If you have an oddly colored or coated tongue, it can be upsetting at first, but can also be cured without second thought. Discover what’s causing your tongue troubles and learn the right way to treat your tongue. The Cause: The main sign of this condition is a white, coated tongue. It often occurs if you’re on antibiotics, taking steroids for asthma, undergoing chemotherapy, or dealing with diabetes or a compromised immune system. A white tongue may also be a sign of leukoplakia from excessive alcohol or tobacco use. The Cure: Brush your tongue twice a day for two weeks. Why you should you brush your tongue? The reason is to ensure that a coated tongue is not an oral hygiene problem. If you continue to have a white tongue, it may be an overgrowth of candida, which is also called yeast or oral thrush. It is easy to treat with an anti-fungal medication. The Cause: This may be a sign of a chronic condition called oral lichen planus, which is when the immune system attacks the cells in the mouth. Middle-aged women most commonly experience it. The Cure: If it is not painful, you probably won’t need treatment. Yet have your doctor monitor your case because you may have a higher risk of developing oral cancer. If the condition is painful, you may be given medication. 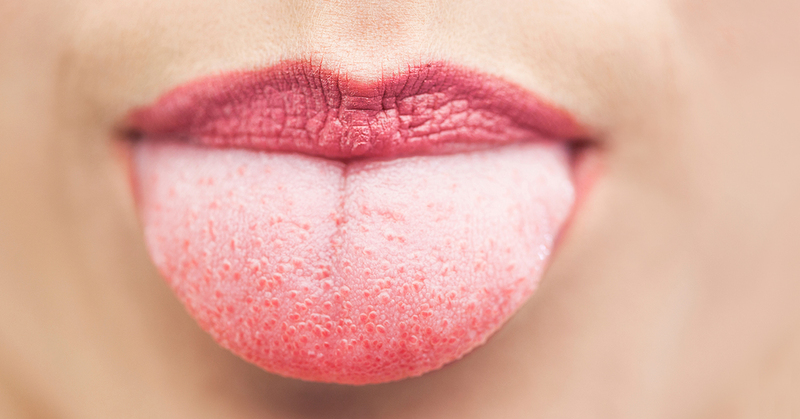 The Cause: A red tongue could be a sign of a sore throat, dry mouth, or vitamin deficiency. But if you have strep throat and a high fever, it may indicate scarlet fever. The Cure: A sore throat can be soothed with throat lozenges and dry mouth can be treated with a product for saliva replacement or by drinking more water. A vitamin deficiency can be corrected with supplements and scarlet fever can be treated with antibiotics. The Cause: The taste buds on the back of the tongue are naturally bumpier than the buds near the front, so expect small bumps in those areas. Eating hot, spicy foods can often irritate them and make them appear larger. Besides these bumps, you may notice others due to canker sores or herpes. The Cause: These typically occur when your teeth press into your tongue while you sleep. Yet ridges may also indicate a fissured tongue, which is a long crack down the center of the tongue. The Cause: Even though this condition looks scary, it’s harmless and typically occurs when cells on the tongue grow faster than they’re shed. It’s associated with improper oral hygiene, antibiotic use, a yeast infection, cancer therapy, and diabetes. The Cure: This condition typically subsides on its own. The Cause: This condition gets its name from a mix of red and white spots on the tongue that resemble a geographic map. It’s simply a sign that your taste buds have worn down in different areas. Interestingly, some medical research indicates a correlation with the autoimmune condition called celiac disease. The Cure: No treatment is required for this common condition.